Description: Design and construction services for a 1-acre residence in the Rancho Solano Neighborhood in North Central Phoenix. 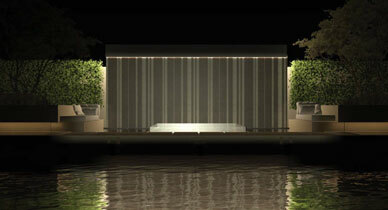 The design is centered around a central concept – the floating house. The main pool is elevated to provide the focal illustion that the house is floating. At the end of the view across the pool is an iconic, glass mosaic tile water wall flanked by two specimen trees. On cross axis with the water wall is a Japanese grotto overlooking an organic water garden through traditional Japanese Shijo doors. The grotto is accessible through the pool by entering under a contemporary subtle sheet of water.